Want to get one month free rent + $1,000 off! Call 24x7 to learn more and schedule a tour! Limited time only. Restrictions apply. Call to learn how to get our limited time offer of one month free rent + $1,000 off! Restrictions apply. Camden Grandview Townhomes is the newest addition in unparalleled luxury in Charlotte just steps away from Uptown! Explore how each of our large two and three bedroom floor plans fits into your wants and needs. Our beautifully appointed townhomes provide you with private surroundings on the edge of Uptown Charlotte, centrally located off South Blvd. within walking distance to Historic South End, the suburbs of Dilworth, and only minutes from BB&T Ballpark, NASCAR Hall of Fame, Metropolitan Shopping Center, and the EpiCentre. Our pet-friendly townhomes feature exceptional living space, 1,755-2,606 sq ft. Perfect for any lifestyle and up to three pets of any size! Experience privacy in your city surroundings with private entrances and attached two car garages. Entertain in your chef-worthy kitchen centered around a free-standing island and featuring stainless steel appliances, frosty carrina white quartz countertops, and beautiful herringbone marble backsplashes. Relax on your large terrace with wood deck flooring and exceptional views of the city and skyline. Indulge in luxurious touches like custom walk-in closets and Italkraft Italian cabinetry in sleek, modern gray. Camden Grandview Townhomes allows you to live the life of luxury you’ve always wanted with resort-worthy amenities like a spectacular saltwater pool, outdoor fireplace, and a lounge and grill area with views of Uptown Charlotte’s skyline. Exercise in our newly renovated fitness center featuring cardio, free weights, TRX suspension training equipment, and a private indoor yoga studio. Take a breath of fresh air while exploring our beautifully landscaped English garden in the courtyard or stroll over to Latta Park. Enjoy time with friends in our game room with a billiards table, catch a flick in our onsite movie theater, or find a quiet space to study or work in our business center and conference rooms. Our 24-hour concierge and dry-cleaning drop-off service at our controlled access community will guarantee a stress-free luxury apartment experience within the comfort of your own private townhome. Residents enjoy easy commutes across Charlotte with direct access to the Carson Street Light Rail Stop, giving you options to live, work and play around the community. Live within walking distance to countless high-end shopping, local restaurants, and fun nightlife just footsteps from your front door. Experience unparalleled luxury and space in your private Townhome, while enjoying city living just steps from the heart of Uptown at Camden Grandview Townhomes. Residents receive a technology package included in the total monthly rent with a savings of up to 48% off retail. This money-saving package includes high-speed internet up to 300 Mbps and 225+ channels including over 120 HD channels and HBO. Looking for more options? Access Time Warner Cable TV and HBO Go from your smart device + over 250,000 Time Warner Cable WiFi hotspots nationwide. Do you have chills yet? Ready to move in? Call our expert leasing staff today for information on availability. Life just got a little more exciting at Camden Grandview! At Camden, your pets are family too! We welcome cats and dogs, up to three pets per townhome. Call us with any pet-related questions! Tuck under garage parking is attached to every townhome for resident parking. 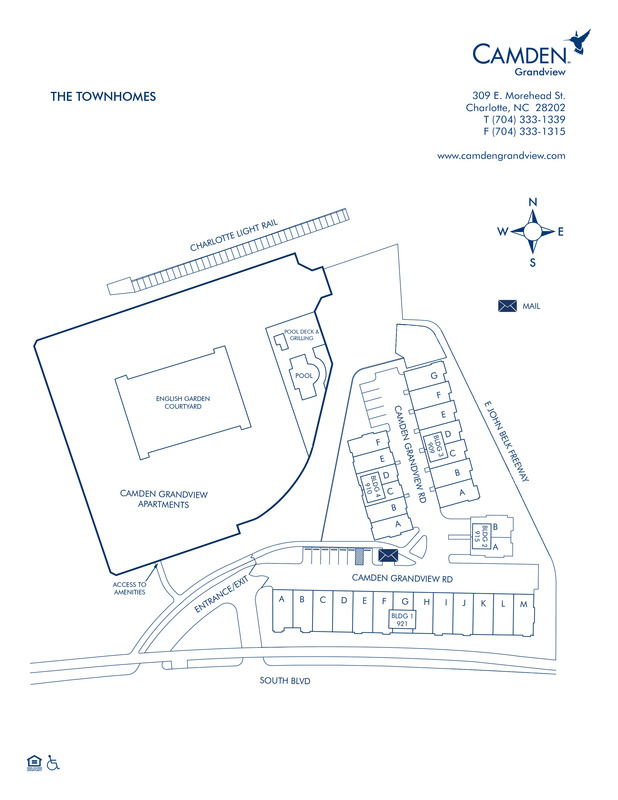 A limited number of guest parking spaces are available within the townhome community.